PHOTO: Allen Ramsey, DWCPhoto.com. Highlands senior Robby Gabbard makes a move in the air in a recent game. 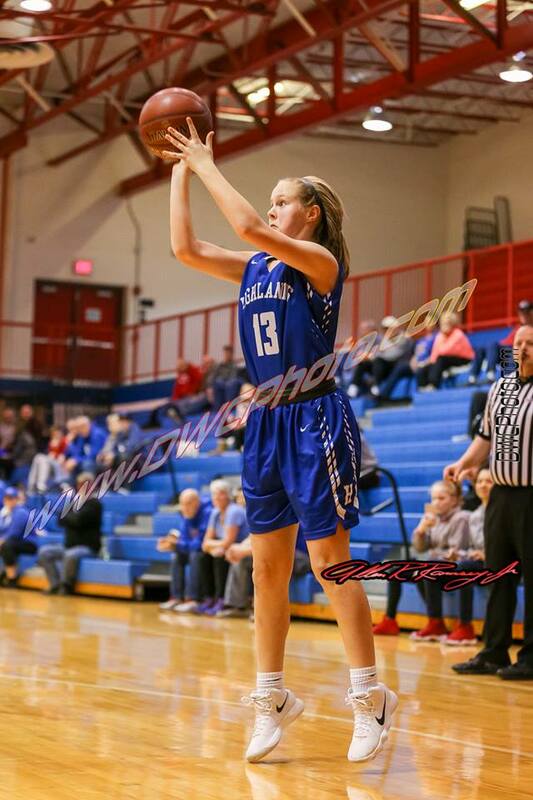 Gabbard scored 13 and grabbed six rebounds to help the Bluebirds to a 48-38 win over Cincinnati Anderson on Tuesday. It is clear the Highlands Bluebirds boys basketball team still has a lot to play for. 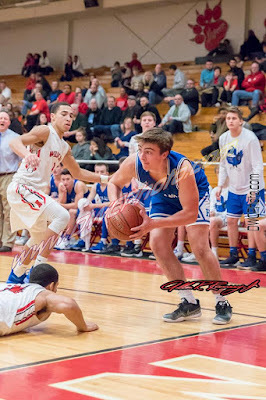 The Covington Catholic Colonels hit them hard in a 71-25 loss Monday on the road. But the Bluebirds bounced right back and defeated 7-10 Cincinnati Anderson, 48-38 to move back to .500 on the season at 11-11 overall. 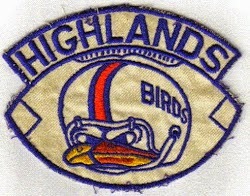 Highlands is one win shy of last season's total. The last thing the Blue and White knew it could not do was take the struggling arch-rivals lightly. The Highlands Bluebirds girls basketball team (17-6 overall) came into the game against the Notre Dame Pandas (7-14) on a five-game winning streak. On the other hand, the visitors owned just 15 win in the last two years and snapped a seven-game losing streak with a 48-21 win over Beechwood on Wednesday. PHOTO: Allen Ramsey, DWCPhoto.com. Highlands senior Brooke Dill (4) goes strong to the basket in a recent game. For two straight days, the number 66 found itself on the Blue and White side of the scoreboard when the clock struck zero. PHOTO: Allen Ramsey, DWCPhoto.com. 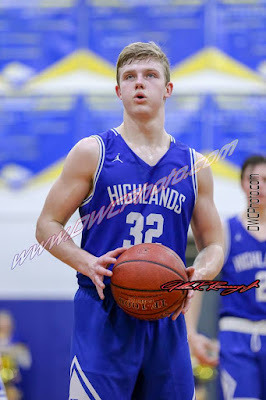 Highlands junior Alex Starkey (32) sets up for a free-throw attempt in a recent game. The Highlands Bluebirds boys basketball team needed this one in more ways than one. 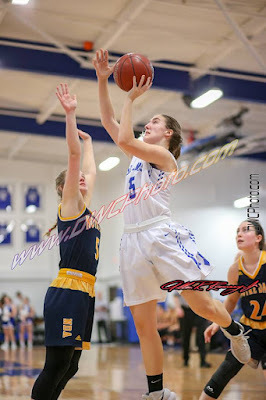 Like two years ago, the Bluebirds (10-10 overall) found themselves in a battle with the host Bellevue Tigers (9-12) in a 36th District battle. But Highlands did enough to pull off the 53-49 win Friday and finish 2-2 in 36th District play. PHOTO: Allen Ramsey, DWCPhoto.com. Highlands senior Katelyn Schneider and the Highlands girls bowling team claimed their third Region 5 title Wednesday in the last four years. 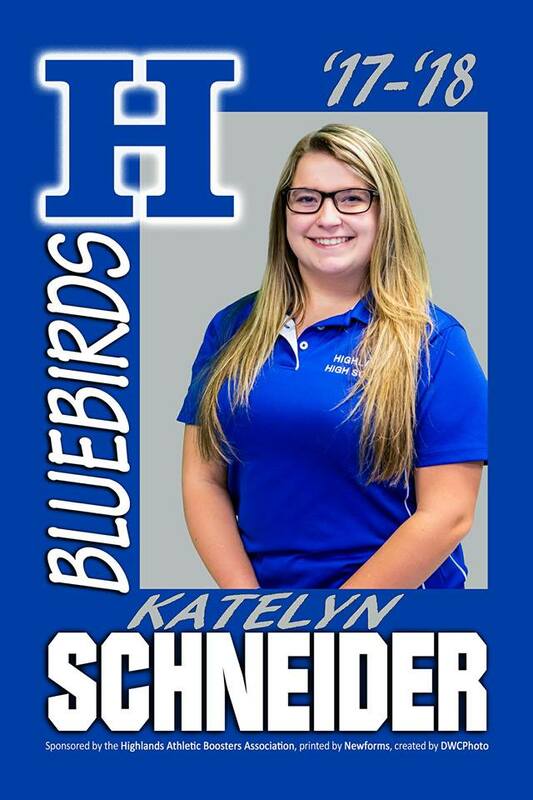 The Highlands Bluebirds girls bowling team claimed the 5th Region championship Wednesday at SuperBowl Bellewood. PHOTO: Allen Ramsey, DWCPhoto.com. Highlands junior Nate Roberts makes a move in a recent game. Head Coach Kevin Listerman said guarding the opposing team's best player better will be a major focus the next couple weeks before entering the 36th District Tournament in Fort Thomas. 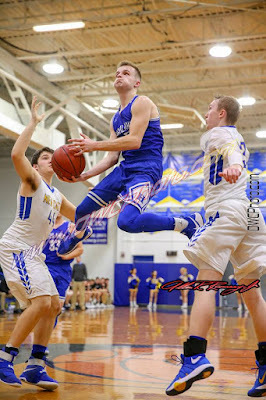 The Highlands Bluebirds boys basketball team (9-10 overall) again struggled with it in an 81-66 loss to the host Newport Central Catholic Thoroughbreds (11-8) on Tuesday. The Thoroughbreds have won 15 in a row in the series and 17 of the last 19. 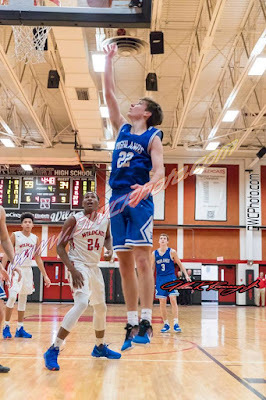 Highlands fell to 1-2 in district play. PHOTO: Allen Ramsey, DWCPhoto.com. Highlands sophomore Rylee Thomas (22) fires up a free throw in a recent junior varsity contest. She scored her first two varsity points in the fourth quarter against Bishop Brossart on Monday. Just two days after their biggest win of the season, it became time to go out and prove themselves all over again. But after a few minutes passed in the first quarter, the Highlands Bluebirds girls basketball team (14-6) showed there would be no letdown Monday. The started rolling at the 5:26 mark of the first quarter and never looked back in a 58-25 non-region win over the host Bishop Brossart Mustangs (12-8). Highlands has won five in a row in the series. PHOTO: Allen Ramsey, DWCPhoto.com. Highlands senior Tyler Gulley goes in for a shot in a recent game. 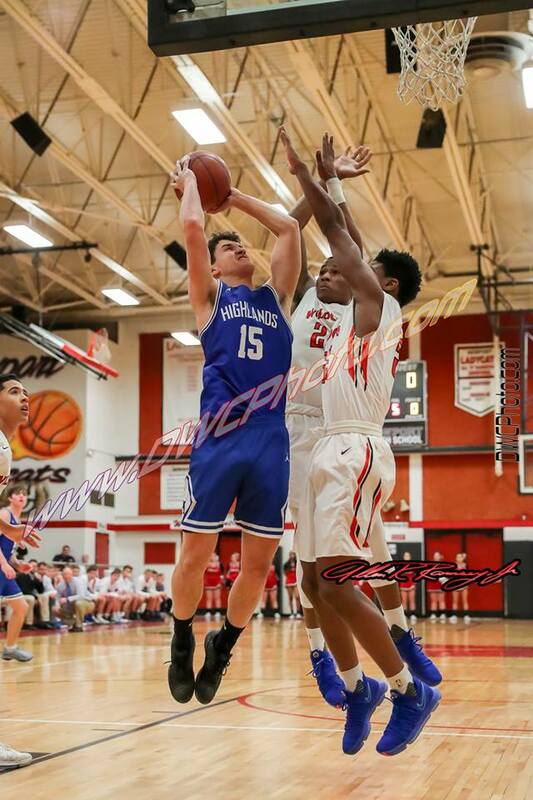 The Highlands Bluebirds boys basketball team had the opportunity to notch its 10th win of the season Friday. But it did not happen. The Dixie Heights Colonels escaped with a narrow 49-47 9th Region win. Both teams are 9-9 on the season. PHOTO: Allen Ramsey, DWCPhoto.com. Highlands junior Griffin Huber (15) goes up for a shot in a recent game. 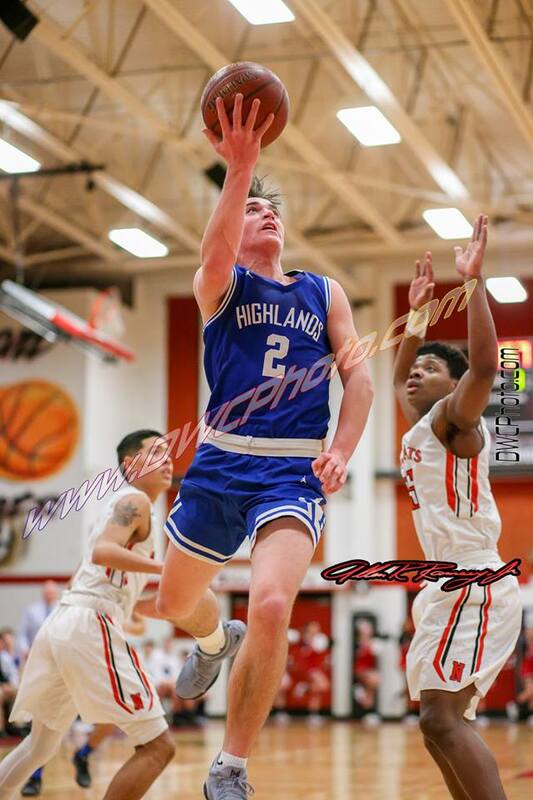 The Highlands Bluebirds basketball team (9-8 overall) dressed 18 players for the 36th District contest against the Dayton Greendevils (3-14). 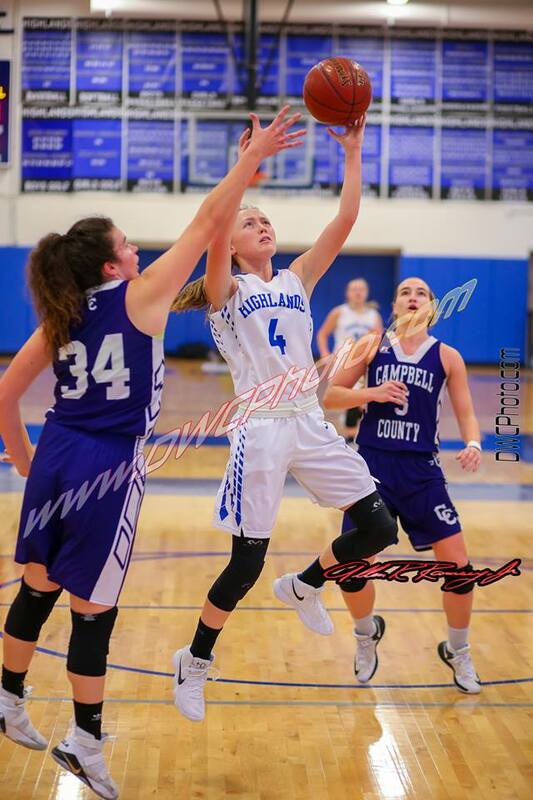 The Highlands Bluebirds girls basketball team (12-6 overall) saw its home game against Covington Holy Cross (12-6) cancelled because of bad weather. PHOTO: Allen Ramsey, DWCPhoto.com. Highlands junior Spence Macke (13) gets off a shot in a recent Junior Varsity game. The Highlands Bluebirds basketball teams had games either cancelled or rescheduled Friday and Saturday. PHOTO: Jared MacDonald, Maysville Ledger-Independent. Highlands freshman Emma Riccobene (31) shoots between Mason County's Rachel Payne (34) and A.J. Reed (11) in the first half Thursday. The Highlands Bluebirds girls basketball team wanted to go back to taking care of the ball the way the Bluebirds have done in the past unlike what happened in the loss at Cooper on Tuesday. Highlands (12-6 overall) turned the ball over less and used a nice game defensively to pull away from the Mason County Lady Royals (10-6) by a 46-37 count Thursday in Maysville. 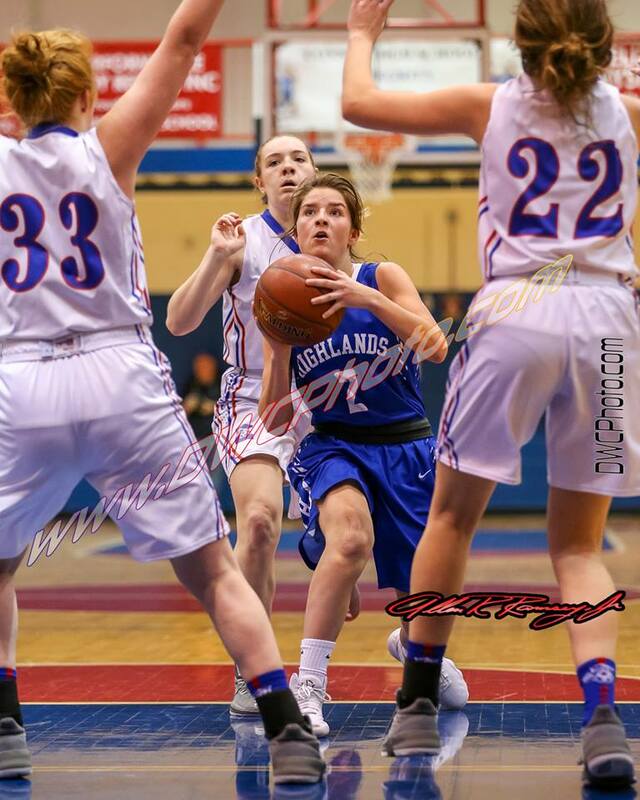 Highlands had just 13 turnovers and Mason County had 20. PHOTO: Allen Ramsey, DWCPhoto.com. Highlands junior Nate Roberts goes in for a lay-up in a recent game. 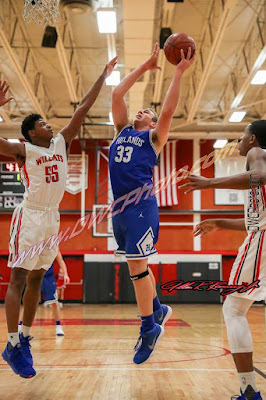 Roberts hit the game-winning shot against Conner with two seconds left Tuesday. 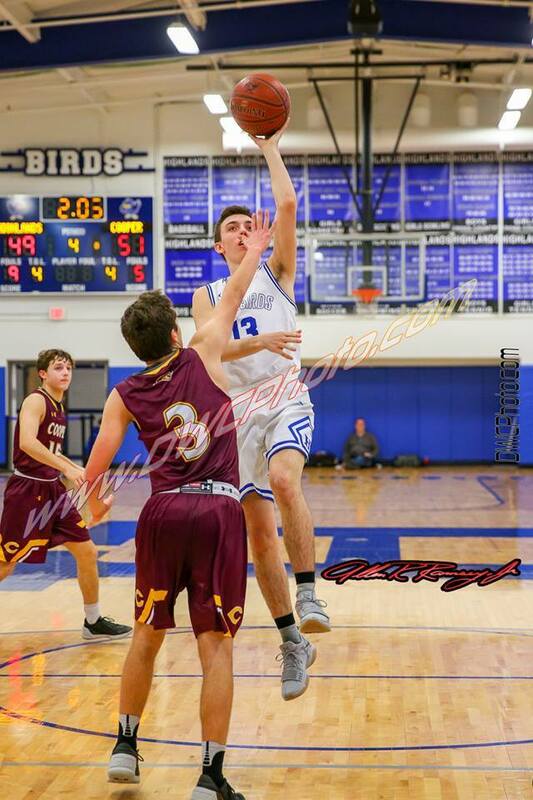 The Highlands Bluebirds boys basketball team (7-8 overall) came up with a clutch play at the end when needed to pull off the road win Tuesday. PHOTO: Allen Ramsey, DWCPhoto.com. 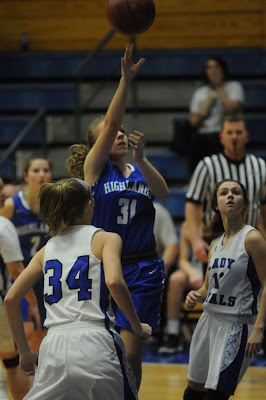 Highlands sophomore Maggie Hinegardner puts up a shot in a recent game. Coaches and players involved in district seed and tournament winning streaks may not think much about them. PHOTO: Allen Ramsey, DWCPhoto.com. Highlands junior Ryan Leigh (22) scores two of his five points at Newport on Friday. The Blue and White hoped to pull off a huge 36th road district win Friday. Dating back to the 2011-12 season, the Highlands Bluebirds boys basketball team (6-8 overall) had beaten the Newport Wildcats (11-4) only two times. The third time since then did not come as the Wildcats jumped out to a 7-0 lead and never looked back in a 73-39 victory. It marked the first district seed game of the season for both teams. PHOTO: Allen Ramsey, DWCPhoto.com. Highlands junior Ashley Hayes (2) makes a move in a recent game. The Highlands Bluebirds girls basketball team took advantage of the opportunity for another big win Thursday. 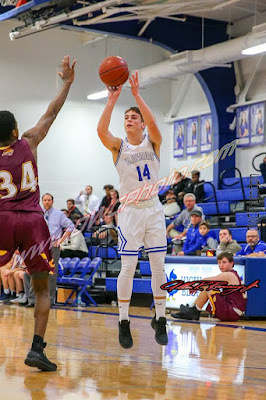 Highlands used the combination of nice offense and tenacious defense to pull away from the visiting Walton-Verona Bearcats, 55-44 in a non-region game. The Bluebirds have won six straight against the Bearcats. The last Walton-Verona win in the series came 56-49 in Walton on Feb. 4, 2012. Both teams are 10-5 overall. PHOTO: Allen Ramsey, DWCPhoto.com. 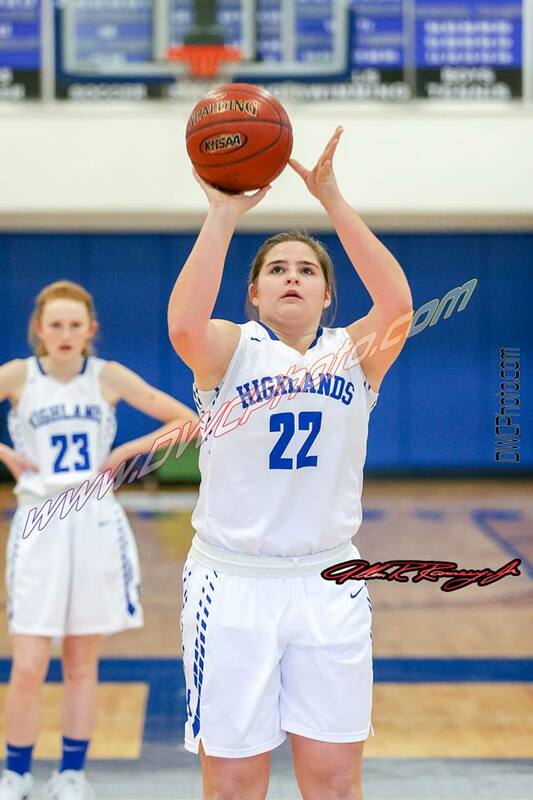 Highlands sophomore Hunter Ahlfeld fires up a shot in the junior varsity contest against Cooper on Tuesday. The Highlands Bluebirds boys basketball team (6-7 overall) dropped the home game 61-43 to the Cooper Jaguars on Tuesday.